It increasingly looks as though the Eurozone's overall economy is close to bottoming out (as discussed here). This improvement may turn out to be transient, but it's real nevertheless. As an example, the January manufacturing PMI numbers are still in a contraction mode, but the trend is no longer downward. Markit (Chris Williamson): - The Eurozone economic picture continues to brighten, with the final reading of the manufacturing PMI for January coming in ahead of the earlier flash estimate. The survey continues to signal an overall deterioration of business conditions, but rose to an 11-month high to suggest that the industrial sector is close to stabilising after contracting throughout much of last year. The improvement was led by Germany, which saw the strongest gain in output of all eurozone states, but rising exports are also helping to revive the manufacturing sectors of other countries, most notably Spain and Italy. There is however a major exception to this trend - one that exists in the Eurozone's "core". The exception is France, whose economic conditions continue to deteriorate. 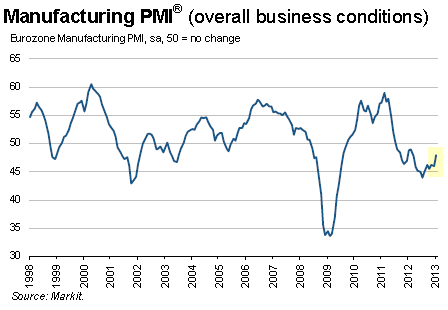 Markit (Jack Kennedy): - The deterioration in French manufacturing sector business conditions continued in January. The fact that new orders fell at the sharpest rate for nearly four years is a particularly concerning development and suggests further steep falls in output are likely as we progress throughout the first quarter. Confidence seems to have evaporated in the face of an increasingly uncertain economic environment, leading manufacturers to make sharper cuts to employment, purchasing and input stocks in the latest survey period. 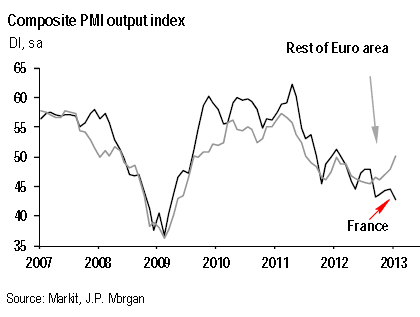 In fact the trends in the composite PMI measures for France vs. the rest of the Eurozone have diverged. Poor competitiveness continues to be one of the key issues (as discussed here). JPMorgan: - A longstanding issue for the corporate sector is its lack of competitiveness. This concern is best illustrated by the European Commission survey data, which show that an increasing number of French firms are expressing a lack of competitive advantage in both domestic and foreign markets. The French trade deficit seen since mid-2004 partly corroborates this argument. Competitiveness issues are part of a broader problem facing France: anemic potential growth (the government assumes potential growth at 1.6% oya) and the structural changes that would be required to raise it. With France's government now representing almost 57% of the nation's overall economic activity, the much needed austerity measures will be a major drag on the GDP growth going forward. And some of the Socialist government's heavy-handed policies (particularly with respect to taxation) are not helping either.